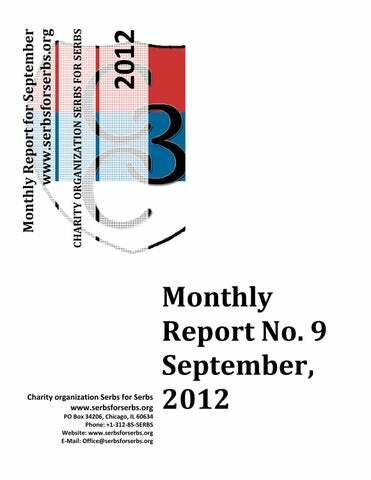 Monthly Report for September Dear friends and donors, Charity organization Serbs for Serb Serbs registered in the state of Illinois in United States in Jun 2010 by the group of the Serbian youth. Charity organization Serbs for Serbs is a 501(c)(3) notfor-profit charitable organization. Donation is tax-deductible deductible to the extent followed by the law. On 30th September, 2011 we finally got the letter from department of the treasury (IRS) with tax exempt 501(c)3 approval. All donations to our organization donated from June 16, 2010 are tax deductible under section 170 of the Code. We are also qualified to receive tax deductible bequests, devises, transfers of gifts under section 2055, 2106 or 2522 of the Code. www.serbsforserbs.org 2012 the population and generally bad economic condition of the households in Serbia, Republic of Srpska and other countries in the Balkan. An average couple has "fallen" on one child. Analysts warn that Serbs will become a minority in its own country in the following century if the nation, individuals and government don't wake up from the nescient in which they've fallen! On the other hand, nobody is talking about the families with many children which grieve by living in bitter poverty. Occupied by their everyday struggle for survival, they are being humbly in their desire for implementing rights which belong to them. Their life stories, fears and problems are identical, but almost invisible and unheard in order to gain the attention of the public, media and even state. That's why the idea of the Charity organization Serbs for Serbs arose. The organization rganization was formed by a group gr of young and trustful people, who are united by the common vision of helping families blessed by many children and who are aware of the fact that even a small help means a lot for those who don't live in a material excess. We are united by the humane idea to help the poorest part of the Serbian nation. Charity organization Serbs for Serbs try to revive the spiritless energy of the Serbian Diaspora which would be able to reinforce people of Serbian heritage as well as all good people throughout the world with minimal, but bu constant monthly donations. We hope and believe that there is also a grain of doing good and that you will join us in the endless e struggle against poverty. God bless and save all Serbian families with many children and our honored donors who participate in the noble effort to return smile on children faces. At the beginning of September, a new common action of helping the endangered Serbian families in Krajina has been conducted. In the action we visited six families. The help was delivered for three families. In the next period, we will provide help for a total number of eight families. The initiative of our organization has been supported and joined by the fraternal organizations by donating money – Serbian Orthodox Youth Innsbruck 1,000 EUR and Serbian Society Zadužbina from Slovenija 700 EUR. In the next couple of weeks, our organization will donate approximately 1,800 EUR for the needs of the families we visited. www.serbsforserbs.org 2012 the consequences of such situation is that he can’t find a regular job. Bearing in mind all of that, we decided to get them a proffesional chainsaw, so that Milan could work for a wage and thus provide additional income for his four children. After family Panić, we visited a young three-member returnee family Šorak. They decided to come back to Korenica with a six-month old daughter Dajana. They live in a newly built apartment, which they use, but it is completely empty. We agreed to get them a washing machine. The father was at work during our visit, so we went with the mother in a nearby store, bought a washing machine, and with a discount, we received a vacuum cleaner. We hope that this humble help will improve the life of a young family. The action continued in Donji Lapac. The first family we visited was a five-member family Rašeta. The family consists of father Dražen, mother Rada and their three children, Jovana (17), Nemanja (14) and Brankica (3). On a first sight we noticed that it is a hard working family. Both parents are currently unemployed, which is almost a fact considering Serbian returnees. Dražen is a war-disabled, but he is struggling for his family. He is finishing the works on a farm of goats they plan to open. Thus, they needed an aggregation for the farm, which we agreed to get them. We continued our journey and visited family Kantar. The family consists of nine members, two brothers with their families and their parents. The couple Branimir and Irena Kantar have three children: Milana (7), Jelena (5) and Miloš (3 months). Branimir’s younger brother Milan also lives in a household with his wife Smiljana. Branimir is a car mechanic, and manages to earn some money for his family. The greatest problem this family is facing is an isolation of the house, because the family was able to provide an isolation of one part of the house. Therefore, we planned to send them a material for an isolation of the rest of the house. We went to Gračac, but we didn’t spend much time there. Instead, we left the money to the friends of the organization who are helping our actions, to provide help for the two families in urgent need. One of them is a nine-member family ðilas, with seven minor children. The father of the family, Radislav, become ill a couple of months ago, and the family lost all the income. We decided to give 90 EUR for the urgent purchase of groceries. The second family we helped was the family of Milanka Jelača and her sister, whom we have helped several times before. The money we left will be sufficient for 5m3 of firewood for the winter. Late afternoon we finaly reached Kistanje, in which we met the friends of the organization from that area, and visited the last two families in the action. Our primary plan was modified on the spot, so upon the call of the local priest from the Benkovac parish, instead of the families in Kistanje, we decided to visit two families in the villages near Benkovac. Monthly Report for September The first family we visited is a five-member family Ćalić in the village Brgut, consisting of father Milan, mother Jasna and children Milica (7), Marko (6) and Miloš (4). Upon the return to their family home, the family faced a burned house and all the other objects. They moved into the object next to the house, which was once a local store, and which is also devastated. They live in three rooms. In a few months, the family will have another member. They are very humble, so except for the freezer, they didn’t ask for anything else, but bearing in mind their situation, we decided to provide also several pieces of furniture for the children. www.serbsforserbs.org 2012 After the hospitality in monastery Krka and the morning Liturgy we attended, we finished the visit to the Serbian families in Croatia. The conclusion after each visit to the returnee families in Krajina remains unfortunately the same. They live in rarely populated areas, without opportunities for the regular jobs, abandoned by their mother country, maltreated by the state in which they live. Serbian families and Serbian children don’t have a bright future. The humble help of the state which took away everything from them, and the spiritual help of the local priests of the Serbian Orthodox Church, who share the same fate, are the only facts which keep the Serbs in those areas. There is a great need of the actions conducted by our and fraternal organizations. The actions which seem great, bring little help in the surrounding conditions. After each of the actions, we call upon the people of good will to join, help for themselves, or in cooperation with our organization, to support the Serbs to stay in their ancestral homes. The providing of certain help, that desire would become meaningful. The last family we visited was the family of which we had no information until we reached their village, but it turned out to be the family Žmirić, a returnee family from USA, which our representatives from Vienna visited two years ago, and helped. Father of the family, Dušan, welcomed us warmly, and thanked for the previous help of our organization. Since our last visit, their condition is slightly improved, because the state built a house for this nine-member family with seven minor children. Dušan has great plans for the family business, but there is a lack of money for the realization. Therefore, we agreed to get them a wood-burning stove, until we meet the conditions for the significant help. www.serbsforserbs.org 2012 and a small greenhouse which Goran built on his own. Goran has completed two crafts, and he also works woodcut. His wife Jasmina left the faculty in order to take care of the children, and their seven children are their biggest treasure. Their children are happy and smiled, and we could notice harmony in the family. Goran told us he wanted to make working places for his children, so that they could continue his work, instead of becoming cases for social care. Jasmina told us that the children can take care of the animals and garden, and that the parents can rely on their children. 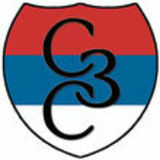 On Sunday, September 2, 2012, the members of the Charity organization Serbs for Serbs visited family Stojanović from Vinorača near Jagodina and family Trifunović from Valjevo. We used the opportunity to agree with family Stojanović about the help we should provide by the end of the year, and made sure that the beds for the Trifunović family have arrived, and ready to use. Family Stojanović has 11 members: grandfather Mladen, grandmother Živka, father Goran, mother Jasmina and their seven children: Jovana (16), Nikola (14), Teodora (11), Jovan (8), Ksenija (6), Sofija (4) and Emilija (1). We wanted to get to know the family and see if we could help them, although they are not complaining about the current situation. Goran doesn't want his children to leave Serbia, because he teaches them to love Serbia and to appreciate life and freedom for which our ancestors died. Goran's and Jasmina's children are being raised to be good people, and to know who they are – the Serbs. Goran built a house with the toboggan in the yard, and put a Serbian flag on it. The children have a basket net, and part of the yard to play. They also have a computer and an internet, but they use it in a reasonable manner. Neither the state, nor the church wanted to help Goran to start a business in agriculture. He suggested that he would help another family in 2-3 years, if we could help them. Considering the harmony, happiness, will to struggle and hard work, we agreed to help them get a greenhouse and planting seed. In the following months we will provide the money for the greenhouse, which should be placed by the end of the year. After that, we went to Valjevo, and visited family Trifunović. During the last visit we agreed to get them five beds for the youngest members of the family. We bought the beds in the amount of 55,000 dinars. Since they have been registered at the Center for social work several months ago, good people helped this family to build another store and make rooms for the children. The Center is still supervising them, and according to the words of the father Milan, they come on a weekly basis, or the family has to go to the Center. The family received a list of terms they must fulfill in order for the children to stay with them, including what to eat during the day. During the visit, a video was made, and it will be played on the regional television Vujić, and we use this opportunity to thank cameraman Miroslav Milovanović for his time and effort. Family Trifunović consists of father Milan, mother Marina and their five children: Nikolina (12), Krstivoje (9), Bojana (6), Ivana (4) and Milica (3). The parents were registered at the Center for social work due to the charges of negligence towards the children, and life in non-hygiene. The neighbors defended the family, claiming that there was no reason to take away the children from the parents. The family lives of Milan's salary as a janitor in a school, and child benefit for four children. www.serbsforserbs.org 2012 wardrobe etc. We hope that the lawnmower will make their everyday struggle for better life easier. …………………………………………………………... Charity organizations Serbs for Serbs helped elevenmember family Kostović from the village Ljuljac near Novi Pazar. We provided lawnmower, in the value of 96,000 dinars. The representatives of the Charity organization Serbs for Serbs sent three school backpacks, three pairs of sneakers and school equipment for the young members of the family Ješić from Prijepolje. We wanted this humble gift to mark the happy and successful beginning of the new school year. We would like to thank our friends from Canada, who recently donated five school backpacks and school equipment. Two of the backpacks were for the Ješić family, and the rest of the package was paid 4,500 dinars. We already helped family Ješić several times before, by providing them the household appliances and firewood. The representatives of the Charity organization Serbs for Serbs visited on Sunday, September 16, family Jovanović from Sremska Kamenica – a single mother Vesna and her five children: Jelena (1995), Marina (1997), Branislava (2002) and twins Marko and Miloš (2003). The family lives in bad conditions – the house is ruined, and it has plenty of holes and cracks, because it is built on a landslide. Despite the problems, the children are good pupils, and mother Vesna is tutoring and doing her best to afford everything the children need for a happy childhood. The monthly income is about 30,000 dinars, and that is not enough for their needs. The house is in a bad condition, and it requires constant investments. The children go to school, and they need the books, school supplies, wardrobe and footwear. Our organization will look into this case, and make a decision of possible help. Until then, we can tell the members of the family Jovanović that they are not alone, that they shouldn't give up, and to endure in the everyday struggle for survival. He wouldn’t take the money we offered as a contribution. Instead, we agreed to give the money to the little boy this monk is helping. As we have announced before, during our last visit to the families Ljiljak from Neuzine and Danjek from Ravno Selo, we made an agreement to enable the members of these families to be baptized. On early Sunday morning, August 26, just before 9 o’clock, eight members of the family Ljiljak and six members of the family Danjek were gathered in the courtyard of the monastery Krušedol. Together with the members and friends of the Charity organization Serbs for Serbs they attended the Holy Liturgy. After the Liturgy, eight members of the family Ljiljak and four members of the family Danjek, and sister Smilja (who decided to be baptized in the last moment) were baptized. The children had six godfathers – members and friends of the organization and two nuns from the monastery. After the baptizing, the godfathers gave each child a cross, Orthodox prayer book, chaplet and three icons. Our friend Milan made photos of the event, and we use this opportunity to thank him. We continued to socialize at the monastery court. Friends of the organization from Novi Sad and Belgrade, as well as monastery brotherhood joined us. Former rector of the Seminary in Karlovac, Archpriest stavrofor Dušan Petrović, and his wife, also attended the event. In the late afternoon we went to the monastery Grgeteg. We took the blessing of three handed Mother of God, and the gift of the monastery and the newly baptized received one icon with three handed Mother of God. From Grgeteg we went to the monastery Velika Remeta, where the Ljiljak family received an icon of their slava, because they didn't have one so far. After the socializing on a beautiful monastery court, with blessings of the father Stefan, and spiritual books, family Ljiljak went to Neuzine, while the Danjek family joined us, and we went together to Novi Sad. www.serbsforserbs.org 2012 On the holiday Beheading of Saint John, the donors and members of the Charity organization Serbs for Serbs visited the brotherhood of the youngest Serbian monastery of the St. Bishop Nikolaj Velimirović on Soko Grad (near Ljubovija), and donated a humble gift for the prosperity and further development of the holy place in the mother country. The monastery is an endowment of the Bishop of Šabac, Lavrentije, dedicated to the St. Nikolaj Velimirovič, who was a bishop of Lelić and Žiča. For more than a decade, an international manifestation Moba is taking place, and gathering the young people from abroad, originating from this place. The monastery complex includes a small church, a museum and an area for the guests, but also the workshop for the brotherhood. The Home of the bishop Nikolaj is located next to the monastery. It has a library, dining room, an apartment with 32 single rooms and other rooms. On the rock which is dominating the area, and which consisted a part of the Turkish fortification, a plated cross has been built, as a sign of the repentance of the German people for having participated in an insane aggression on Serbia in 1999, a gift to the monastery by the family Vrobel from Germany. A monument of the St. Bishop Nikolaj, 3 meters high, is a work of Darinka Radovanović, a sculptor from Belgrade, and it is a present of Branko Tupanjac, a Serb from Chicago. In the spiritual oasis, one can often find artists, painters, writers... all those who are seeking for the harmony of the spirit and the world. The humble room of the museum contains the documents and photos of the life and work of Bishop Nikolaj, from his birth until his death. Second part of the museum space is dedicated to the archeological objects, history of Soko grad, life and customs of the inhabitants. As well as their late predecessor, nun Jefimija, the nuns of this monastery have given a number of handcraft, apart from their prayers and regular monastery chores. There is an artistic workshop, next to the church museum, where the nuns are painting icons and frescoes, and embroidery on silk, in praise of the Lord and holy teachers. Prayer chapels are very special, and they are located outside the monastery complex. There are 10 chapels of stone from the monastery to the plated cross. Each of them contains one of the 10 Commandments of God, and the Serbian painters have painted the interior of the chapels. A voyager can think, in silence, of each Commandment, and find a way to the Lord, and see his life path, pure thoughts of his life on earth among people. Members of the Charity organization Serbs for Serbs from Niš and Switzerland were the guests of the family Nikolić from Bojnik, who made a thanksgiving lunch for the members of the organization, and also for all the friends and neighbors who helped in building the house. The works on the house commenced about year and a half ago, and during that time, family Nikolić, together with friends and neighbors, managed to build a nice, big house on which all the inhabitants of the village ðace near Bojnik are proud of. The youngest members of the family didn't have enough place to sleep in their house. Six children have been sleeping in a room of 10m2 size, while the other members of the family were sleeping with their relatives of friends who live nearby. After the great project of our organization, family Nikolić now has another 70m2, i.e. 3 bedrooms, a living room, bathroom and big terrace. The house is finished on the outside, and it still needs to be painted inside, it needs a laminate and a bathroom, and the youngest members of the family will be able to enter their new rooms. The family plans to finish the inside of the house within a month. This project enabled all the members of the family to sleep in their house, under the same roof, due to which this family expresses immense thank to all the donors who helped in the action. The project will have been finished when the Charity organization Serbs for Serbs buys three beds. www.serbsforserbs.org 2012 time, building good friendships that will hopefully last a long time. The palacinka party was a success on two levels; one, we were able to gather $615 in donations and two, we were able to spend time with friends and show our children how important it is to not forget their Serbian heritage and culture. Sunday night, friends and family gathered once again in Chicago to collect donations for Serbian children while enjoying palacinke and drinks. There were plenty of amazing palacinke thanks to Ceca Petrovich and some quality, 5 year aged, homemade rakija from Cacak. The donors were thanked for all of their contributions, help and support (most friends who attended have donated many, many times). The hosts expressed how important these types of events were for the children in Serbia and how much their contributions really mean to struggling families all over Serbia. Hopefully, now that winter is coming, there will be many more palacinka parties! God bless and protect our children! Donors in September: Number of donors in 2012. Serbs for Serbs Report September 2012.